View cart “Landscape Sketching Course” has been added to your cart. Do you ever dream of becoming an artist but keep putting it off until you have ‘more time’? The very thought of the blank white canvas can cause a state of anxiety. You can quickly find yourself as the ‘art admirer’ rather than the ‘art creator’. And you begin to wonder, what if, when you start painting, your paintings look …terrible. It’s enough to leave your paints in the box and promise you’ll start next week!!! On this course, I teach you the foundations of working with acrylic paint and how they are the simplest and most effective way for an absolute beginner to learn how to paint successfully. They can be used in thin layers like watercolours or in thicker, more opaque applications like oil paint. They dry quickly and can be diluted and cleaned with water, making them simple to use and odorless. With over 3 1/2 hours of tuition, you’ll observe beginner and advanced acrylic painting methods from underpainting and glazing to impasto and textural effects. Split over 7 lessons this course can be tackled daily, perfect if you want a painting week or you can study one lesson every weekend to start your painting practice. 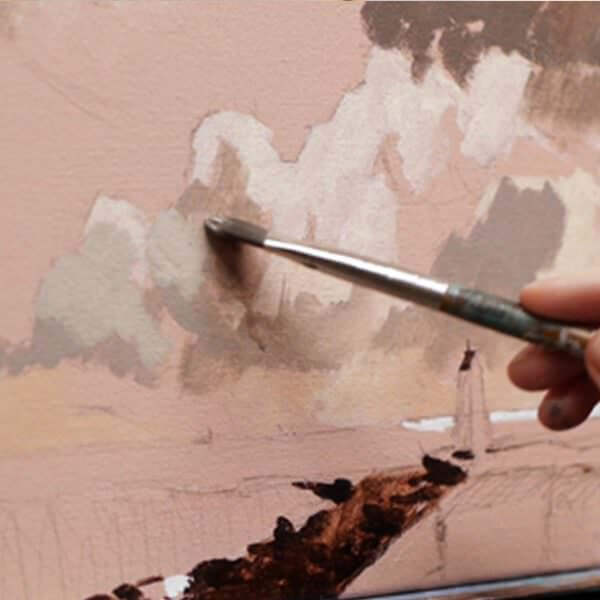 The course covers setup and materials, colour mixing and pigment choice, brush-handling and palette-knife techniques, as well as gels and mediums.You’ll complete a still-life, landscape & seascape using three different colour palettes, from vivid turquoise to muted earth tones. So why don’t you grab a brew and join me on this acrylics beginners course to unleash your inner artist, put paint to canvas and gain a solid foundation of painting knowledge. 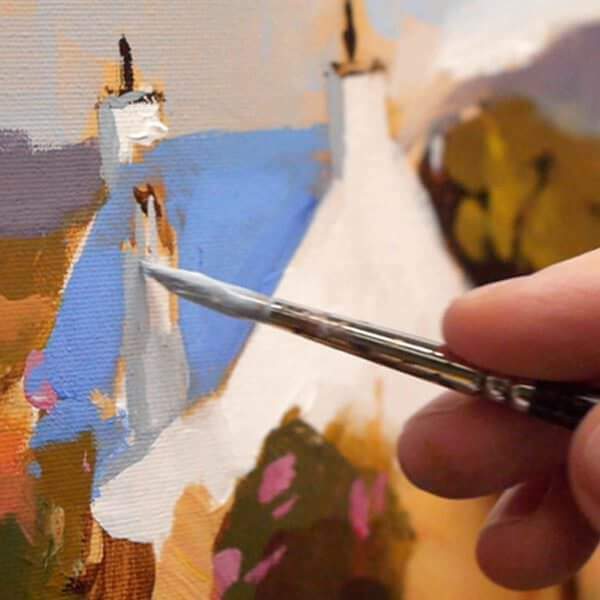 On this Absolute Beginners Acrylic Painting Course, I want to engage aspiring artists who have been putting off their creative adventures and build confidence by slowly introducing painting concepts one at a time. Why do we put off starting the things we’d love to achieve? You want your first paintings to look great, but anxious they might not, so you put off the inevitable and don’t paint at all. In the beginning, you will make some mistakes. We all do. But here’s a little secret from my easel. During every new painting I’m working on, there’s a stage where the painting seems to take two steps back. If you follow the lessons you’ll begin to develop an intuitive understanding of what you’re doing, you’ll get better and start to see results. This course has been designed in ‘bite-size’ lessons, each one no longer than 45 minutes. They have been broken down into chapters, so even if you only have 15-minute sessions, you can still learn a key concept. Trying to learn a new anything feels so huge! There’s so much to learn and you just don’t know where to start. Bearing that in mind, I’ve designed this course so each lesson is easily achievable, with a full material list that only uses a few paint colours, 2 brushes and limited other materials. I’ve included my line drawings for you to work from, so you don’t have to be an experienced draughtsman. Each time I tackle a new technique on the course, I explain why I’m doing it and the results I’m looking for – so you can follow along really easily. #4 You don’t know what to paint. You feel like you’re creatively blocked. You want to have moments of inspiration and blurred days without sleeping or eating just painting at the easel, but when you try and think what to paint, your mind goes as blank as the canvas. For this course, I’ve created 3 demonstrations with downloadable reference images for you to work along from. This will take the pressure off and can often jump start your own ideas and inspirations. Each demonstration uses a different colour mood and painting techniques, so you can start to explore which style of painting suits you best. This is a simple, easy-to-follow downloadable video course with over 3 hours of tuition, where you will discover the essentials of how to create an acrylic painting ‘that works’ and is aimed as if you’re completely new to painting. I come from an art education background where I’ve designed art curriculums for schools, developed interactive learning resources with the National Gallery, London and taught students from all different starting points the principles of how drawing and painting work. This course has been designed as a step-by-step rounded learning experience bringing together all my knowledge as a student, painter and teacher. 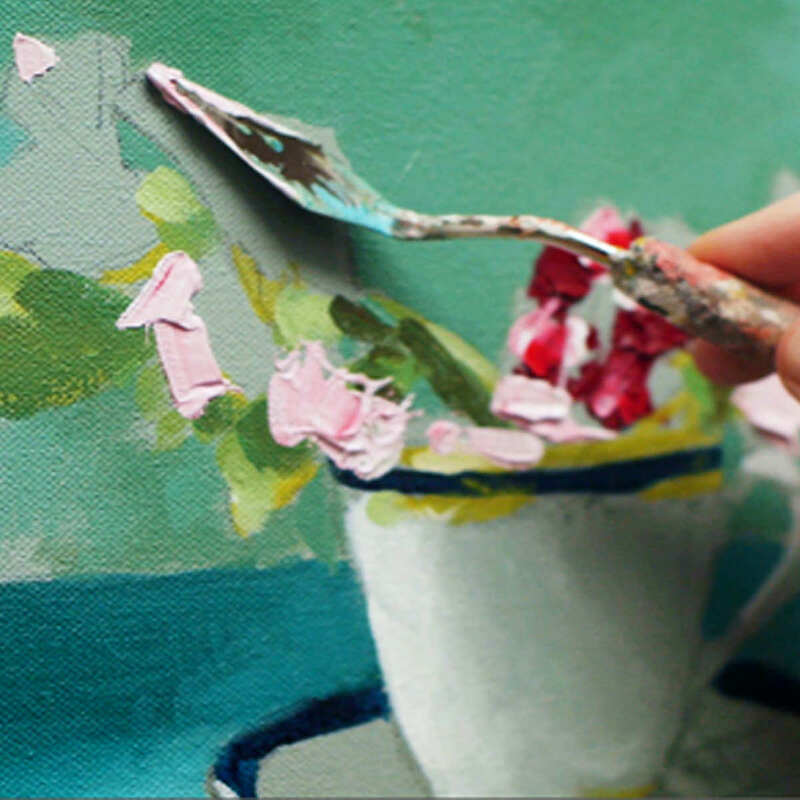 3 x acrylic paintings taking you step-by-step from drawing, right through to the final glazes. Over 3 hours of detailed video instruction so that you can follow along at your own pace. Downloadable reference jpeg images, line drawings, and a full materials list. An introduction to all the materials for the course. Brushes, palette choices, surfaces, canvases and all the extra essentials you might need as a beginner. 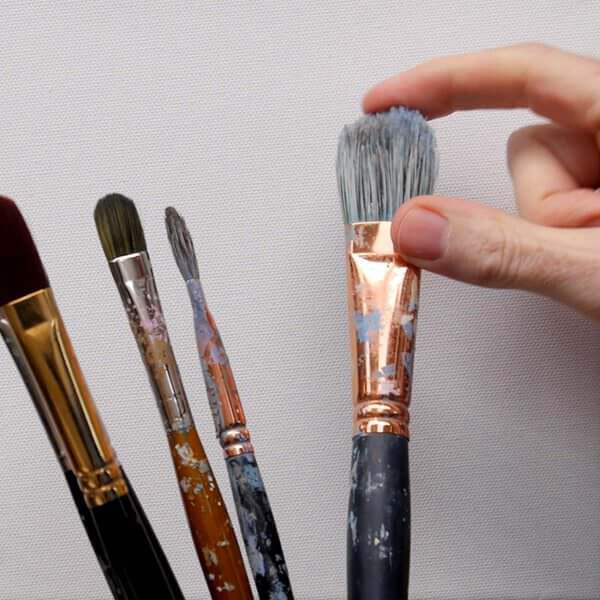 Introducing acrylic mediums to the palette and how they change the paint handling properties, thinning acrylics with water and the importance of paint consistency. Learning how to prepare a canvas and establishing the 3 tone masses. Introducing brush handling, coloured layers and applying thin glazes of colour to add depth and complexity to complete our first landscape study. Comparing and contrasting pigments from an art historical perspective – earth colours to man-made colours. Discovering the hidden bias in your paint tubes, the key to successful colour mixing. Introducing a simple colour palette that gives a wide range of possibilities with minimal outlay and maximum results. How to mix and match a paint swatch and use classical techniques to create harmony and balance in our seascape. Introducing gels and pastes that create texture and body before we get creative with a sunset! Using alternative tools and approaches to paint abstract, rather than using a traditional brush. Bringing our knowledge together, combining watery washes, thick impasto and textural mediums to create an exciting still life final piece. 7 Downloadable Step-by-Step Video Lessons – over 3 hours of video instruction that once downloaded – you have any time, anywhere access. (please note: you do not receive a DVD). A Your Materials PDF – which includes a full materials list. A Your Paintings Downloads PDF guide – which includes all the jpeg reference images used throughout the course, alongside line drawing guides. The video files are large (2.5GB) so you need a broadband internet connection and enough space on your computer hard drive. A broadband internet connection – the files sizes for the video lessons are quite large (2.5 GB in total) so can take a while to initially download (depending on your internet speed.) Once downloaded, they are yours to keep forever, watch without buffering or take to the garden and watch away from an internet connection! Thanks for your fantastic online tutorials. I’m a computer science lecturer and have recently taken to acrylic painting to relieve stress during our recent strike action, having never really painted before. Your tutorials have helped me very much in understanding what I’m doing and I’m getting a lot of pleasure out of it. Looking forward to progressing through your lessons. Below you will find my last painting studies from this course. My saucer in the flower/cup is somewhat wonky but I must say it was a fun learning experience, especially using the heavy gel, which of course I got carried away with in the application, Oh Well! without mistakes we don’t learn, laugh, or carry on in our struggle to be better. Thanks again Will for encouraging & sharing. See you soon in your Color Course/Portrait Course! Do you cover Plein Air painting techniques? No, all the painting demonstrations are studio based. Do you demonstrate with OPEN acrylics? No, this course focuses on standard acrylics. An absolute beginner or an aspiring artist who has tried a few paintings on their own but have been disappointed with their results.